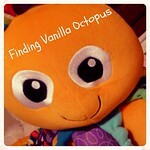 Finding Vanilla Octopus: Happy Monthday, Mia! Despite a lazy, unproductive morning, a fussy baby, and dinnertime houseguests, I actually managed to pull off a photo shoot in commemoration of the culmination of Mia's first month. I still don't know quite where the month of April went, and I am shocked beyond description that it's really been so long since Mia joined our family, at last. It feels like only yesterday that Tom and I went through the craziest, most beautiful, most amazing experience together in the bathroom of our tiny home while the older siblings-to-be chattered away around the dining room table in the very next room. Paradoxically, it hardly seems possible that there was ever a time that Mia wasn't with us. I made my first attempt to take some pictures of Mia just before our guests arrived, but Mia was still put out from having her clothing and diaper changed, and would not consent to leave my arms. She happily transferred to her father's, though, so I took advantage and snapped a few shots with him just in case I didn't get another chance later. She's pictured there with Piglet, who I just purchased on a whim after having a conversation with Tom the other day. Apropos of nothing, he said, "So, if Abby is Pooh, and Michael is Tigger, what is Amelia? Piglet?" (Aunt Marcia bought Abby a stuffed Pooh Bear in February of last year, and Michael received a stuffed Tigger from a friend around the same time). 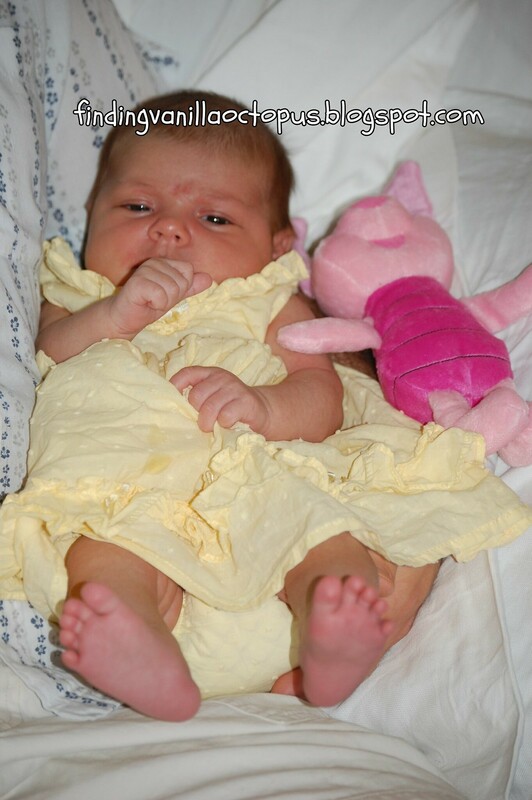 I agreed that Piglet seemed fitting, and made sure to order one for her in time for her one-month pictures. However, Piglet turned out to be much smaller than I expected, and I remembered that I'd actually posed Michael with both Pooh and Tigger, so I decided to use all three with Amelia when she finally provided me with a brief window of opportunity to try again. Of course, this finally happened after Mia had spit up on her dress two or three times, and during the course of our visit with friends. Thankfully, they were very gracious and made no complaint as I shuffled about with my camera, snapping away and occasionally readjusting Mia and her pals. 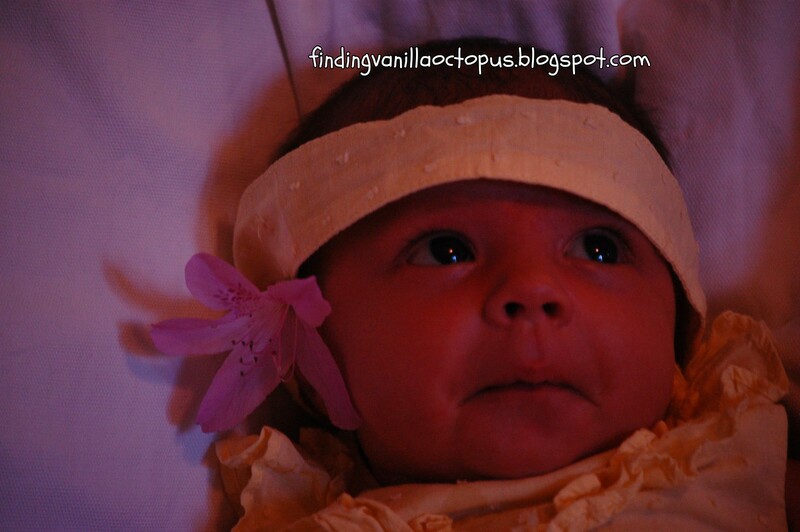 The headband that came with Mia's new dress is, sadly, still too big for her tiny little head, but I endeavored to keep it on for most of the shoot all the same, because it looks so darned cute. When I first began taking pictures, Abby was outside for a bit with her father. Upon her return, she came bearing a flower, which Tom tucked behind Mia's ear. Unfortunately, it wasn't long before Abby tried to take advantage of the fact that Mia was so accessible. Big sister loves her little sister snuggles. And I love to let her have them, when I can, but her adorable head was getting in the way of my shots. Of course, that's when cropping comes in handy. However, Abby's presence within the frame did ultimately throw off the focus a bit (it landed on the flower instead of Mia, because the flower was closest to the center, and I failed to notice before taking the picture). ... which I kind of wish I had managed to take before going off of auto, because I love it, but it's terribly dark. Of course, it came out that dark because I initially forgot to mess with the other relevant settings, but even after doing so I wasn't getting any good quality pictures, so I switched back. This time, I experimented with the Dynamic Autofocus (as opposed to Closest Subject), though I'm not sure that I'm happy with the results. Though it solved the problem of out-of-focus feet in the foreground, it seems to me that I sacrificed a bit of sharpness overall by selecting that mode. But maybe it's just in my head. So here we are, one month in, and moving steadily forward. Though I desperately want to slow the changes down, it's still exciting to observe them; to see identifiable features emerge, from the newborn awkwardness, in her face. She looks so very much like her sister, and now, so very much like- well- herself. She's growing stronger with each day, and more alert. She's spending increasing amounts of time awake. Sadly, though her congestion is finally clearing, she is continuing to have a bit of tummy trouble. Despite that, she's been a champ about tummy time, lasting five minutes or more before making any complaint if I time it right. She's still not particularly tolerant about being put down during the day, and continues to stubbornly refuse any offerings of a pacifier. Her nighttime routine remains the same: a 3-4 hour independent stretch at the beginning, and the rest of the night right up next to me (though a large part of that can be blamed on me, as I'm far to sleepy and tired, once woken, to make repeated attempts to put her back down in her sleeper). 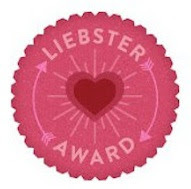 Tonight, however, marks a new milestone. She's starting it off in the mini-crib for the first time. Though it took four or five attempts to finally get her down, she has stayed for nearly two hours, now. She seems to squirm around much more in her crib than she did in her sleeper, and even woke for about ten minutes at one point before managing to fall back asleep on her own. Here's hoping that she lasts for another hour or so more; I think we'll then officially be able to call her first night a success. Ha! It seems that as I typed that last sentence, Mia managed to work one arm out of the swaddle and wake herself up again. I have a feeling that I may have to intervene this time- I guess we'll see. Ah, well. Like so many other transitions are and will be, it's "baby steps," right?